February 2019 : gave the invited 1-hour talk "Polygonal meshes of superpixels for image over-segmentations based on topological skeletons" at the seminar in the School of Computing at the University of Buckingham, United Kingdom. January 2019 : launched the MIF++ network of bi-weekly seminars with lunch to attract new collaborators to the MIF. January 2019 : presented the paper "A persistence-based approach to automatic detection of line segments in images" (joint with Grzegorz Muszynski) at CTIC 2019 (Computational Topology in Image Context), published in LNCS. January 2019 : paper "Topological Data Analysis and Machine Learning for Recognizing Atmospheric River Patterns in Climate Data" (with PhD student Grzegorz Muszynski, Karthik Kashinath, Michael Wehner, Prabhat) is accepted in GMD. January 2019 : Naohiko Ban has presented our 37-page paper "Development of a Reconstruction Method for Major Vortex Structure around Tandem Flapping Wing Object via Vortex Trajectory Method" (joint with Wataru Yamazaki) at the American Institute of Aeronautics and Astronautics Science and Technology Forum and Exposition 2019, San Diego, US. December 2018 : our research with PhD student Grzegorz Muszynski funded by Intel through the Big Data Center at the Berkeley lab (US) has been highlighted in the HPC wire news Topology Can Help Us Find Patterns in Weather. November 2018 : the blog post how to join the research group advises potential intern students, PhD candidates and postdoctoral fellows about the transparent and multi-stage selection of candidates who wish to join the TDA group. November 2018 : invited talk "A comparison of skeletonization algorithms for unorganized point clouds" at the workshop Trends in Persistent Homology in Queen's University Belfast (UK) to celebrate the appointment of Dr Florian Pausinger. November 2018 : the London Mathematical Society has extended the funding for the network Applied Algebraic Topology covering 3 meetings per year at the Universities of Liverpool, Queen Mary London and Southampton. October 2018 : our Materials Innovation Factory was officially opened by Sir Venki, the president of the Royal Society. October 2018 : new PhD students joined the group: Marco Mosca, Miloslav Torda, Katerina Vriza, Cameron Hargreaves. September 2018 : PhD student Grzegorz Muszynski presented our paper "Towards a topological pattern detection in fluid and climate simulation data" (joint with Karthik Kashinath, Michael Wehner and Prabhat) at Climate Informatics 2018. September 2018 : we have attended the kick-off meeting of the EPSRC grant "Application-driven Topological Data Analysis" (2018-2023), which funds a few members of the group. September 2018 : the research of PhD student Grzegorz Muszynski was highlighted in HPC wire and Berkeley lab news. September 2018 : postdoctoral assistant Dr Ana Garcia has started her 5-year position in the Topological Data Analysis group, funded until August 2023 by the EPSRC grant "Application-driven Topological Data Analysis" (EP/R018472/1). August 2018 : our group has organised the Topological Data Analysis workshop combined with the 11th meeting of the Applied Algebraic Topology network meeting in the MIF, where Phil has given a good talk on skeletonisation algorithms. July 2018 : 30-min invited talk at the Big Data Summit in the Berkeley lab on the joint work with the 2nd year PhD student Grzegorz Muszynski funded by Intel. July 2018 : the 1st year PhD students Phil Smith and Yury Elkin have successfully delivered their annual presentations. July 2018 : the paper "A Higher-Dimensional Homologically Persistent Skeleton" (joint with Sara Kalisnik and Davorin Lesnik) has been accepted by the journal Advances in Applied Mathematics. June 2018 : new summer students joined our TDA group, namely MSc students Thomas Welsch, Cameron Hargreaves, Gemma Cook; 2nd year students Antoine Rohmer, Di Liu; and visiting student Arshad Suddiqui from India. June 2018 : gave the invited 6-hour tutorial on Topological Data Analysis (with my PhD student Krasen Samardzhiev) at the Data Science summer school in Ecole Polytechnique near Paris. June 2018 : attended the HerberFest (devoted to 60th birtday celebtrations of my co-author Prof Herbert Edelsbrunner) and presented the poster (joint with my PhD student Yury Elkin) "A fast recognition of branched shapes of micelles in colloids" at ATMCS8, IST Austria. June 2018 : Mr Nathaniel Shiyamjith was selected as a new PhD student co-supervised by Prof Robert Page, Dr Laura Harkness-Brennan and Dr Vitaliy Kurlin (25%), funded by the Big Data Science Centre for Doctoral Training in Physics. June 2018 : invited 30-min presentation "Superpixels for image over-segmentation based on topological skeletons" at the SIAM Imaging Sciences, Bologna (Italy). June 2018 : Dr Ana Garcia was selected for a 5-year postdoctoral position from September 2018 funded by the EPSRC grant "Application-driven Topological Data Analysis" (jointly with Oxford and Swansea) in our TDA group. June 2018 : our outline proposal (with Prof Frans Coenen) for the UKRI Centre for Doctoral Training in Artificial Intelligence for Future Digital Health at the University of Liverpool was invited to the next stage of the competition. May 2018 : Mr Marco Mosca was selected as a new PhD student supervised by Dr Vitaliy Kurlin (80%) and Prof Andy Cooper (the MIF director) on the project "Discovering hidden patterns in high-dimensional data for materials science" funded from October 2018 by the EEE&CS school in the University of Liverpool. May 2018 : the paper "Atmospheric River Tracking Method Intercomparison Project (ARTMIP): Experimental Design and Project Goals" by Grzegorz with many co-authors was accepted in Geoscientific Model Development (impact factor 3.5). May 2018 : Mr Thomas Welsch was selected as a new PhD student supervised by Dr Vitaliy Kurlin (80%) and Dr Shan Luo on the project "New methods of Geometry and Topology for solving Computer Vision problems in Materials Science" funded from October 2018 by the EEE&CS school in the University of Liverpool. May 2018 : 1-hour talk on Skeletonization algorithms with theoretical guarantees for unorganized point clouds at the online seminar of the Applied Algebraic Topology Research Network. May 2018 : Ms Katerina Virza was selected as a new PhD student supervised by Dr Matthew Dyer and Dr Vitaliy Kurlin on the project "Data Driven Discovery of Functional Molecular Co-crystals" funded from September 2018 by the CCDC, LRC. May 2018 : Our Materials Innovation Factory at the University of Liverpool scoops Design Through Innovation award. April 2018 : Mr Miloslav Torda was selected as a new PhD student supervised by Dr Yannis Goulermas, Dr Vitaliy Kurlin (40%) and Prof Graeme Day (Southampton) on the project "Analysis of energy landscapes of molecular crystal structures employing combinatorial and topological methodologies" funded from October 2018 by the EEE&CS school and the LRC. April 2018 : PhD student Grzegorz Muszynski talked at EGU 2018 (European Geophysical Union General Assembly) and I presented a poster at the ARTMIP meeting on our work "Topological Data Analysis and Machine Learning for Detection, Classification, and Characterization of Atmospheric Rivers" joint with Karthik Kashinath, Prabhat, Michael Wehner. March 2018 : Cameron Hargreaves was selected as a new PhD student on the project "Data Science and Machine Learning Applied to the Discovery of Solid Lithium Ion Conductors" supervised by Dr Matthew Dyer and Dr Vitaliy Kurlin (40%) from October 2018 and funded by the Faraday Battery Challenge. March 2018 : with Prof Andy Jones we've organised the workshop "Big data Analytics and Machine Learning Meets Omics" to start funded collaborative projects between Computer Science and Institute of Integrative Biology at Liverpool, UK. March 2018 : awarded 2700 GBP by the EPSRC for a 10-week summer project of the 2nd year undergraduate Gee Jack at the University of Liverpool to work on visualising topological shapes of high-dimensional datasets in Materials Science. February 2018 : Naohiko Ban, Eris Tricker, Asim Munshi finished internships and gave great talks at the group seminar. February 2018 : Intel has continued to fund us (another gift of 40K USD for the 2nd year of Grzegorz Muszynski's PhD). February 2018 : the school of EEE&CS at Liverpool has funded a PhD studentship "Discovering hidden patterns in high-dimensional data for materials science" from October 2018 to be supervised by Dr Vitaliy Kurlin and Prof Andy Cooper. January 2018 : invited talk "A new solution to the data skeletonisation problem for 3D point clouds from micelles" at the Science and Technology Facilities Council in the Daresbury lab, given jointly with my PhD student Yury Elkin. January 2018 : the EPSRC awarded £2.8M to the 5-year project Application-Driven Topological Data Analysis in 2018 - 2022 (EP/R018472/1) at the Universities of Liverpool, Oxford, Swansea. I've led the Liverpool team with a budget over £715K. December 2017 : the Computer Science department at the University of Liverpool awarded the £1K visiting fellowship to invite Dr Vanessa Robins from ANU (Australian National University) for a visit to the TDA group on 11-15 June 2018. December 2017 : the Royal Society (UK) has awarded £12K (International Exchanges programme) for bilateral visits (until December 2019) between the TDA group at Liverpool (UK) and Prof Herbert Edelsbrunner's group at IST Austria. November 2017 : the London Mathematical Society has awarded £1200 for the network Applied Algebraic Topology with 3 meetings per year at the Universities of Liverpool, Queen Mary (G.Bianconi, M.Farber), Southampton (J.Brodzki, J.Grbić). November 2017 : Yury Elkin has started his PhD "Topological Analysis of Colloids" funded by the School of EEE and CS. October 2017 : the paper Superpixels Optimized by Color and Shape (joint with former final year project student Donald Harvey) was presented in a 20-min talk at EMMCVPR 2017 (Energy Minimization Methods in Computer Vision and Pattern Recognition) with a 14-page publication in LNCS, Springer. October 2017 : we have started the regular seminar of the Topological Data Analysis group in the Materials Innovation Factory (office 36). Phil Smith has given the first two talks "Combinatorial graphs" and "Topological graphs". September 2017 : PhD student Grzegorz Muszynski (funded through the Intel Parallel Computing Centre at Liverpool) has won a Data Competition on recognising astronomical objects (Data Challenge #2: Astronomy Catalogs) at Berkeley. September 2017 : participated in the research programme on Topological Data Analysis in the HIM (Hausdorff Institute for Mathematics), Bonn (Germany). September 2017 : 30-min talk "Topological methods for a faster materials discovery" at the Mathematical Signal Processing and Data Analysis conference, Bremen (Germany). September 2017 : talk "Topological methods for a faster materials discovery" at the Leverhulme Research Centre workshop "Harnessing the exponential growth", Liverpool (UK). September 2017 : announced the NIPS 2017 workshop covering Topological Data Anaysis and referring to my blog. August 2017 : our group has established the partnership between Intel and the University of Liverpool (UK) as a part of Big Data Center at the Berkeley lab (US). Since April 2017 Intel sponsors the PhD of Grzegorz Muszynski on a Topological Analysis of the Climate System. The second supervisor at the Berkeley lab is the Senior Staff Scientist Michael Wehner. August 2017 : paper Convex Constrained Meshes for superpixel segmentations of images (joint with former final year project student Jeremy Forsythe) has been accepted in the SPIE Journal of Electronic Imaging. July 2017 : kick-off meeting of the LIV.DAT CDT on Big Data Science at the Physics department in Liverpool, where I'm co-supervising (50%) with Dr Laura Harkness-Brennan the PhD of Mr Fraser Holloway on Topological Data Analysis methods for AGATA (a gamma-ray detector). June 2017 : invited 45-min talk "Topological methods for a faster materials discovery" at Applied Topology, Poland. June 2017 : invited 20-min talk "Topological Data Analysis for Materials Science" at the networking event between Unilever and Materials Innovation Factory, Liverpool. May 2017 : Mr Fraser Holloway was selected as a PhD student in Big Data Nuclear Physics jointly supervised with Dr Laura Harkness-Brennan and funded by the LIV.DAT CDT at the Physics department in Liverpool from October 2017. May 2017 : Mr Krasen Samardzhiev was selected as a PhD student in Geographic Data Science jointly supervised with Dr Daniel Arribas-Bel and Prof Alex Singleton, funded by the Data Analytics and Society CDT in Liverpool from October 2017. May 2017 : invited 30-min talk "Topological Data Analysis for Materials Science" at the International workshop on machine learning and data analytics in advanced metals processing sponsored by Sir Henry Royce Institute, Manchester, UK. May 2017 : public talk "What can Deep Learning do with Big Data?" in a pub at the Pint of Science festival in Liverpool. May 2017 : many thanks for the positive evaluations of COMP315 taught for the first time in the new department. May 2017 : 20-min software demo "Line segment detector inspired by Topological Data Analysis" at ACAT (Applied and Computational Algebraic Topology), HIM Bonn, Germany. April 2017 : Mr Grzegorz Muszynski has started his PhD on "Topological Analysis of the Climate System" at the University of Liverpool in April 2017 funded by Intel Corporation through the Big Data Centre at the Lawrence Berkeley lab (US). We have jointly completed the blog post introducing Atmospheric Rivers, which is the first topic of his PhD. March 2017 : awarded 2700 GBP by the EPSRC for a summer 10-week project of Simon Hirst to work on coloured meshes of polygonal superpixels, which continues the Computer Vision project started with Microsoft Research. March 2017 : Mr Philip Smith was selected as a new PhD student to work on Computational Methods for a faster Materials Discovery funded by the Leverhulme Centre at the Materials Innovation Factory in Liverpool from October 2017. February 2017 : talk "Data Skeletonisation methods with theoretical guarantees" at the University of Brighton, UK. January 2017 : awarded 1800 GBP from the school impact fund for the 4-week internship of Grzegorz Muszynski to work on a new method for a straight line detection in 2D images, which contributes to the project with Microsoft Research. December 2016 : joint paper Resolution-independent superpixels based on convex constrained meshes without small angles with Andrew Fitzgibbon (Microsoft) and Jeremy Forsythe (TU Wien) was presented in the 20-min oral at ISVC 2016: International Symposium on Visual Computing. December 2016 : 15-min presentation "Topological Methods for Pattern Detection in Climate Data" by my forthcoming PhD student Grzegorz Muszynski on our joint work with D.Morozov and Prabhat at the American Geophysical Union Fall Meeting 2016, Berkeley (US), the largest Earth and Space Science meeting in the world with about 25K participants. December 2016 : talk Topological Data Analysis (pdf slides, 40 pages, 2.7M) at the Statistics seminar, Nottingham, UK. November 2016 : talk on Data Skeletonisation at the Stochastic Topology seminar, Queen Mary University of London, UK. October 2016 : invited presentation at the Computational Materials Design workshop in the Leverhulme Research Centre. September 2016 : Mr Philip Smith has completed the summer project Superpixel meshes for faster image and video processing funded by the London Mathematical Society. September 2016 : talk "Topological Computer Vision" at the Computer Science department, University of Liverpool, UK. September 2016 : elected to the EPSRC Associate College of Peer Reviewers to serve the research community in the UK. September 2016 : started as a Senior Lecturer (Associate Professor) with research in the Materials Innovation Factory and teaching in the Computer Science department, University of Liverpool, United Kingdom. August 2016 : 1-hour keynote lecture "Graph reconstruction from noisy scans based on persistent homology" at BTM (British Topology Meeting 2016), Glasgow University, UK. July 2016 : 30-min demo "Graph reconstruction from noisy point samples" at ATMCS 8 (Applied Topology: Methods, Computation, Science, the main biannual conference in Applied Topology), Turin, Italy. July 2016 : 20-min oral presentation "Topological Computer Vision" at 7 ECM (European Congress of Mathematics, the main quadrennial European conference in Mathematics), Berlin, Germany. July 2016 : Mr Aryaman Patel from National Institute of Technology Karnataka (India) has completed his summer internship with me. July 2016 : Grzegorz Muszynski has started his internship co-supervised by me until mid-December 2016 at Lawrence National Laboratory in Berkeley (US) and will continue as a PhD student funded by Intel at Liverpool, UK. June 2016 : visited Prof Gunnar Carlsson at Stanford University (US) and Ayasdi, and Prabhat at Lawrence National Laboratory in Berkeley (US), which was funded by the International Engagement Travel Grant (2K GBP). June 2016 : talk "Topological Data Analysis for Materials Science" at the University of Liverpool, UK. June 2016 : talk "Topological Data Analysis: theory and applications" at the University of Edinburgh, UK. May 2016 : the London Mathematical Society has awarded a summer bursary for Philip Smith (value 1.1K GBP) to work on our project Superpixel meshes for faster image and video processing in August - September 2016. May 2016 : talk "Topological Computer Vision" at the Biomathematics Seminar in Imperial College London, UK. April 2016 : talks "Topological Computer Vision" in Department of Computer Science at Middlesex University and at the Cambridge Image Analysis seminar of Dr Carola-Bibiane Schonlieb at Cambridge University, UK. April 2016 : 25-min talk at the symposium Today's Data Predicting Tomorrow, Loughborough University, UK. April 2016 : 20-min talk at BAMC 2016: British Applied Mathematical Colloquium, Oxford University, UK. March 2016 : won a travel grant of the London Mathematical Society to give the 20-min talk "Topological Computer Vision" in the section "Mathematical Image and Signal Processing" at 7ECM (European Congress of Mathematicians) at TU Berlin on 18-22 July 2016. March 2016 : many thanks for the positive evaluations of the service course Single Maths B. March 2016 : organised (jointly with M.Grinfeld and M.Haw) the ATI strategic workshop on 14 March 2016 : Topological Data Analysis in Materials Science and Engineering. March 2016 : talk "Topological Computer Vision" at Pure Colloquium in Leeds, UK. January 2016 : won a Christopherson/Knott fellowship at Institute of Advanced Study (left after moving to Liverpool). January 2016 : 20-min talk Topological Computer Vision at the ATI workshop Developing the Mathematical Foundations of Learning for non-Euclidean Objects (Alan Turing Institute, UK). January 2016 : 40-min talk "Topological Computer Vision" at Prospects in Data Science (Southampton, UK). December 2015 : the secondment at Microsoft Research Cambridge was extended to 2016 - 2017, 20K GBP from EPSRC and 17K GBP from Microsoft for a postdoc, plus Microsoft's in-kind 45K GBP. December 2015 : with colleagues M.Grinfeld and M.Haw at Strathclyde University (UK) we have secured the grant of 3K GBP to run the workshop on Topological Data Analysis in Material Science and Engineering. December 2015 : Topology III has come to the 1st place in student questionnaires, see summary and comments. December 2015 : talk "Computing invariants of knotted graphs given by sequences of points in 3-dimensional space" (pdf slides, 24 pages, 1.4M) on TopoInVis 2015 paper at the seminar in the National University of Ireland (Galway). November 2015 : paper accepted at Pattern Recognition Letters (11 pages), journal impact factor 1.55. November 2015 : talks "Topological Computer Vision" at the Analysis Seminar in Loughborough University, at the Pure Mathematics Colloquium and a related talk at Statistics Seminar in Durham University (UK). October 2015 : 15-min software demonstration "HoPeS: cloud segmentations and persistent skeletons" (pdf, 16 pages, 1.4M) at Computational Geometric and Algebraic Topology, MFO Oberwolfach, Germany. September 2015 : organised (with D.Schuetz) 4th meeting of the LMS-funded Applied Algebraic Topology network. September 2015 : 25-min talk Topological Computer Vision at the ATI workshop, University of Oxford, UK. September 2015 : paper "A Homologically Persistent Skeleton is a fast and robust descriptor of interest points" (pdf, 12 pages, 1.2M) was presented at CAIP 2015, published in Lecture Notes in Computer Science, v.9256, 2015. August 2015 : M. Iglesias-Ham presented our accepted paper "Relaxed disk packing" (joint with H. Edelsbrunner) at CCCG 2015: Canadian Conference on Computational Geometry, see abstract and pdf at arXiv:1505.03402. July 2015 : 30-min talk "Fast and stable topological profiles of noisy 2D images" at ACA 2015: Applications of Computer Algebra, Kalamata (Greece) extending results from CVPR and CTIC. July 2015 : 40-min talk (pdf, 32 pages, 4.7M) at ACAT 2015 in IST Austria on the paper (published in CGF) "A homologically persistent skeleton of an unstructured point cloud in a metric space" (pdf, 14 pages, 3.2M). July 2015: 30-min talk at SGP 2015 (Eurographics Symposium on Geometry Processing) in Graz, Austria on "A homologically persistent skeleton of an unstructured point cloud in a metric space" (pdf, 14 pages, 3.2M), which was published in Computer Graphics Forum (journal impact factor 1.64), v.34, no.5 (2015), p.253-262. June 2015 : 30-min talk (pdf slides, 32 pages, 4.7M) at DyToComp 2015 in Bedlewo (Poland) on the paper "A homologically persistent skeleton of an unstructured point cloud in an metric space" (pdf, 14 pages, 3.2M). May 2015 : 45-min talk Topological Data Analysis with applications to Computer Vision at the workshop MMMDS: Mathematical Methods for Massive Data Sets, Edinburgh University, United Kingdom. May 2015 : paper "Computing invariants of knotted graphs given by sequences of points in 3-dimensional space" presented at TopoInVis 2015: Topology-Based Methods in Visualization, Germany. Details are at the project page. April 2015 : 20-min talk "Topological Data Analysis" at the symposium Mathematics of Information at BMC/BAMC 2015: British Applied Mathematical Colloquium, Cambridge University, UK. March 2015 : three talks "Homologically persistent skeleton" (pdf slides, 32 pages, 4.7M) at the seminar of Prof Herbert Edelsbrunner in IST (Institute of Science and Technology, Austria), seminar of Prof Walter Kropatsch in Pattern Recognition and Image Processing Group at TU Wien, geometry seminar of Prof Johannes Wallner in the Institute of Geometry at TU Graz (Austria). March 2015 : paper "A linear time algorithm for visualizing knotted structures in 3 pages" (pdf, 12 pages, 2.7M) presented in the 30-min talk (pdf slides, 20 pages, 1.6M) at the conference IVAPP 2015 in Berlin, Germany. February 2015 : grant awarded (1.7K euros) by ACAT (Applied and Computational Algebraic Topology) network of ESF (European Science Foundation) for a short visit to IST (Institute of Science and Technology, Austria). February 2015 : talk "Homologically persistent skeleton" (pdf slides, 48 pages, 3.8M) at the workshop Algebraic Topology: Computation, Data Analysis, and Applications in Oxford Mathematical Institute. February 2015 : two talks Topological Data Analysis at the seminar organised by Prof Alexander Gorban at the University of Leicester (UK) and the seminar of Complexity Theory and Algorithmics Group, University of Liverpool (UK). January 2015 : three talks Topological Data Analysis at Applied Algebraic Topology network, Queen Mary University of London (UK), Transpennine Topology Triangle meeting, University of Sheffield (UK), Winter School on Low-dimensional Topology, La Llagonne, France. December 2014 : talk "Configuration spaces of round robots moving in a metric graph" (slides in pdf, 32 pages, 460K) at the Mathematical Physics seminar in Bristol University, UK. December 2014 : talk on Topological Data Analysis at the Geometry and Topology seminar at Glasgow University, UK. 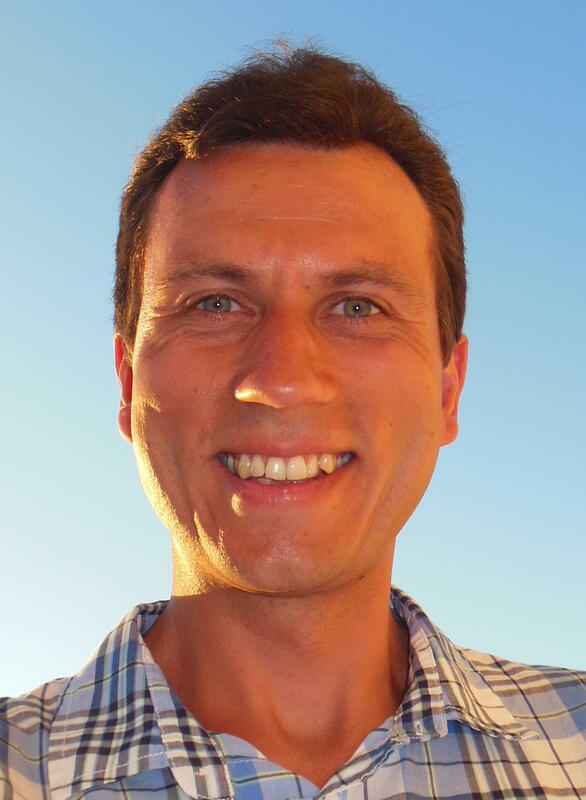 December 2014 : talk "Auto-completion of contours based on topological persistence" at the seminar of Frédéric Chazal in the Geometrica Group at INRIA Saclay, France. Slides (pdf, 36 pages, 2.2M). November 2014 : poster (pdf, 1M) at DCAT: Discrete, Combinatorial and Algebraic Topology, Copenhagen. October 2014 : invited seminar talk at the Pathway to Impact seminar, Durham, UK. September 2014 : invited talks (20 min each) at CTIC: Computational Topology in Image Context, Romania. Slides "Auto-completion of closed contours based on topological persistence" (pdf, 36 pages, 2.2M). Slides "Drawing a graph in 3 pages within its isotopy class in linear time" (pdf, 20 pages, 1.6M). September 2014 : invited talk (30 min) at the British Topology Meeting 2014, Southampton, UK. August 2014 : paper "Computing a skeleton of the configuration space of 2 round robots on a metric graph" (with M. Safi-Samghabadi) accepted at ICRoM 2014: International Conference on Robotics and Mechatronics. July 2014 : invited talk (45 min) at the Applied Algebraic Topology workshop, Castro Urdiales, CIEM, Spain. June 2014 : 1-min video spotlight at CVPR 2014 (Computer Vision and Pattern Recognition, Columbus, Ohio, USA): "A fast and robust algorithm to count topologically persistent holes in noisy clouds" (poster in pdf, 2.2M, ID 1997). June 2014 : invited talk at the seminar of Roberto Cipolla in Engineering Department, Cambridge University, UK. May 2014 : invited talk at the research seminar in Engineering and Computing Sciences, Durham, UK. April 2014 : final version of "A fast and robust algorithm to count topologically persistent holes in noisy clouds" (1.6M) for proceedings of CVPR 2014: Computer Vision and Pattern Recognition, a top 3 conference in Computer Science. March 2014 : started the research blog on Topological Data Analysis : theory, examples, applications. March 2014 : EPSRC KTS grant (20K GBP) awarded to spend the academic year 2014-2015 working on applications of Topological Data Analysis to Computer Vision at Microsoft Research Cambridge, UK. March 2014 : Topology III module has been highly ranked by students again, summary & comments. February 2014 : talk "Topological Data Analysis: potential applications to Computer Vision", video at the Machine Learning and Perception seminar, Microsoft Research Cambridge, UK. January 2014 : talk "Book embeddings of Reeb graphs in shape analysis" at Warwick University, UK. December 2013 : Topology III module was highly ranked by students, summary and comments. December 2013 : talks "Introduction to Topological Data Analysis" at Durham and Aberdeen, UK. November 2013 : successfully passed the exam after the practical First Aid course (about 20 hours). October 2013 : 15 new students (who had passed the rigorous entrance exam) started the MSc course. September 2013 : paper How many wireless sensors are needed to guarantee connectivity of a 1-dim network with random inter-node spacings? (pdf, 200K, 24 pages) published at J Applied Probability and Statistics. August 2013 : interactive maths sessions (23 hours) organised for summer school students of age 15-16. July 2013 : invited lecture (40 min) at the international conference Applied Topology, Bedlewo, Poland. July 2013 : invited lecture (30 min) at Applied and Computational Algebraic Topology, Bremen, Germany. June 2013 : participated in major conferences COLT 2013 (Computational Learning Theory) in Princeton and ICML 2013 (International Conference in Machine Learning) in Atlanta, USA. June 2013 : first self-funded PhD student Marjan Safi-Samghabadi has successfully completed the thesis in algorithmic and topological robotics, the title is Collision-free motions of round robots in metric graphs. May 2013 : shortlisted by students as one of three final nominees for the Lecturer of the Year award by DSU (Durham Student Union) in the Faculty of Science at Durham University, United Kingdom. April 2013 : video of the invited talk on a graph reconstruction at Edinburgh University, United Kingdom. March 2013: invited talk at the Computer Science Department, University of Liverpool, United Kingdom. March 2013: demo presentation at DGCI 2013: Discrete Geometry for Computer Imagery, Seville (Spain). March 2013 : Topology III module was highly ranked by students, see the summary and comments.